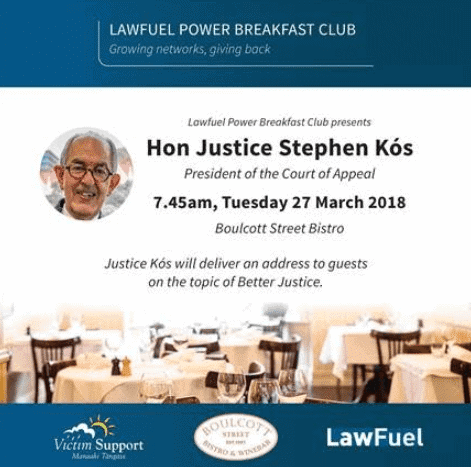 LawFuel Power Breakfast - Hear Justice Kos Speak on "Better Justice"
As sponsor for a new charity breakfast series in partnership with Victim Support, LawFuel is proud to present the LawFuel Power Breakfast Club and invite you or your firm to consider joining us. Over the course of 2018, members will receive entry to three exclusive events at one of Wellington’s premier dining establishments, Boulcott Street Bistro, while enjoying the chance to hear from and engage with a different leader from the very top of the profession at each event. We are excited to welcome the Hon Justice Stephen Kós as our first speaker for 2018. The Lawfuel Power Breakfast Club is a highly cost effective opportunity to demonstrate corporate social responsibility while enjoying the opportunity to engage closely with thought leaders in our industry. Access to three events with unique, top-level speakers – Corporate memberships are completely transferable, so you can share tickets within the firm based on varied interests. Opportunities to provide valuable client experiences – A different kind of corporate box! Use your tickets or purchase extras to host clients interested in a topic or speaker. A very cost-effective opportunity to demonstrate corporate social responsibility – point to your firm’s support for Victim Support on your website or in your next government tender. 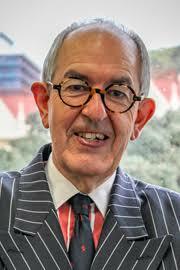 Insights and professional development opportunities through engaging with high-level speakers. Enjoy high end dining at Boulcott Street Bistro – only open for breakfast for this unique event series. Support a fairer and more accessible justice system, with all ticket proceeds to Victim Support. Membership options are available from just $599 for a full year. For a further discussion on your or your firm’s involvement, simply contact Cam at events@victimsupport.org.nz or 04 817 0259.